I grew up in the 70s and am feeling pretty nostalgic these days. I love the way you approached sharing the salad as both a list and story. The tone in the second poem is nostalgic. 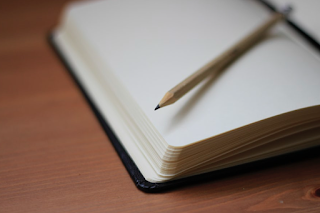 Isn't it always the challenge, deciding the voice and lens of a piece of poetry or writing. Wow - two for the price of one! Love the comparison of the two types of poems. Both bring a different feeling and emotion. I'm not sure I got either one to the place I had hoped, but it is interesting how many different angles can be found. I love both of these! I think we grew up about the same time because I totally remember all of your retro 70 mentionings! Easy bake oven? Yep, had one of those (and burned my knuckles many times). And my mom and grandma made this fruit salad all the time, but usually with white marshmallows and a little coconut. I love both of these approaches! Yes, the old retro Easy Bake that looked a bit more like a standing over than the one that now looks more like a microwave. I think mine was an odd green color. I had a popcorn maker too that came with salted flavoring you put on the popcorn. I think I lost interest in making popcorn after the salt packages were gone. And then your story poem, I was standing there beside you waiting for that glass of juice from your grandma. The version we had included sour cream, coconut, and pecans. 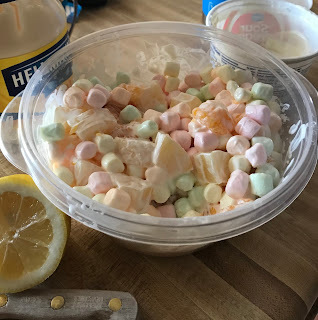 White marshmallows only and was called 5 cup salad, but it was really 6 cup with the 2 added cups of fruit. And it was best when it sat in the refrigerator for a few hours of overnite. There is some sitting in my refrigerator right now. I called my mom for details on the recipe and decided to make it. As I was making it I commented to my daughter that I wasn't sure it would quite taste like Grandma's. Her wise reply, "Even if you get it exactly right it won't quite taste like your Grandma's because she didn't make it." She gets it.